Today at TechCrunch Disrupt NY, we had both the founder of AdBlock Plus Till Faida and Interactive Advertising Bureau CEO Randall Rothenberg on our stage — but not at the same time, mostly because Rothenberg refused to even shake hands with Faida in public. Rothenberg minced no words in his dislike for AdBlock Plus, which will whitelist some advertisers if it deems their ads unintrusive (and — for some — when they pay), but he also mixed in a bit of understanding for those who want to use ad blockers. Taking a more conciliatory tone, Rothenberg also said that his organization is working with quite a few ad blocking companies — his problem is mostly with the likes of AdBlock Plus. “He thinks they are in the public service business,” he said about Faida. He admitted that there are plenty of issues with ads causing slow load sites, but also argued that the IAB is trying to fix this through projects like its lean principles initiative. 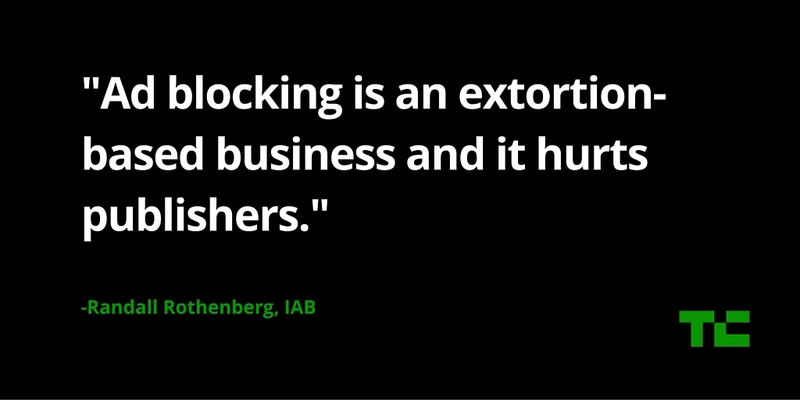 Rothenberg also doesn’t think ad blocking will kill online publishers anytime soon. “It’s still not having that much of an impact outside of tech sites and gamer sites,” he said (which isn’t great for TechCrunch and similar sites, of course).